As everyone has started gearing up for the World Cup in Russia, most teams have announced the squad they will be taking to Russia. Those who haven't submitted the squad have released a preliminary list which will be shortened before June-4. Based on that, there are some debutants who will be playing their debut world cup despite being on the international scene for a long time. Some of them missed out on the 2014 World Cup due to injuries, while some got their national call-up only after that. Chelsea's player of the season burst onto the scene in 2015, when he was an integral part of Leicester City's still-unbelievable title winning campaign. He went on to make the PFA team of the year, and was snatched up by Chelsea immediately in the next summer. The next season saw Kante being integral to yet another title winning campaign, this time with the Blues and he won the Premier League player of the season. His second season with the club hasn't been as successful, but Kante still remains their most important player. He made his international debut on 25th March, 2016 against the Netherlands in an international friendly, and has been a permanent part of the squad since then. 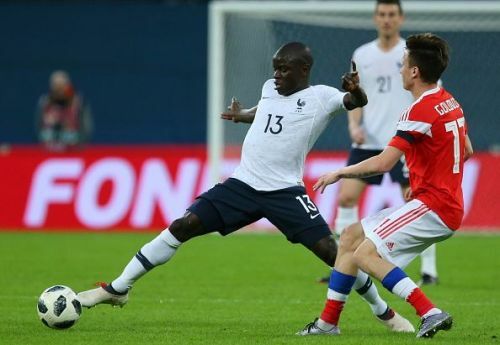 Kante was absent during the Euro 2016 finals, which France famously went on to lose against Portugal. Alongside Paul Pogba in midfield (and maybe Matuidi/Lemar) Kante will provide the defensive cover while the others venture forward. Ever present on the field and never resting, Kante will be a very interesting watch during this world cup.